Charlie Sheen will have a hell of a time selecting his intern -- TMZ has learned Charlie has received more than 70,000 applications from people in 181 countries. 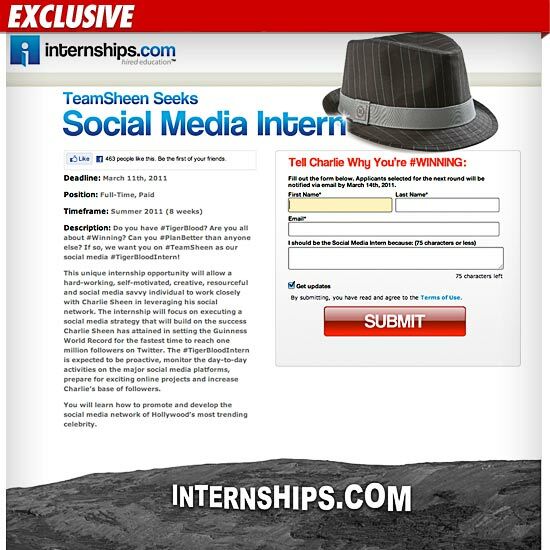 Earlier this week, Sheen announced he was looking for a "winning" social media intern to join his team for an 8-week paid internship. According to a rep from Internships.com -- the site Charlie is using to recruit his intern -- 74,040 people applied from all over the world. As for any potential risks associated with the gig -- the rep tells us, "We always encourage candidates to research the company and position they're applying for."